Mix together 80ml olive oil, the lemon juice, garlic, and parsley. 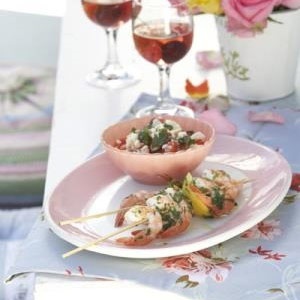 Place four prawns and the lemon wedges on the skewers and put in a bowl suitable for marinating. Pour the olive oil and lemon juice mixture over, cover them and place in the fridge for about an hour. Grill the prawns in a preheated oven on a grill setting or in a griddle pan until cooked through. The prawns cook quickly, so be careful not to overcook them. Mix the tomatoes, feta, mint, and leftover olive oil, season and dish over the grilled prawns before serving. Make sure the wine you choose has a healthy acidic balance to offset the lemon and tomato. A sauvignon blanc or even an MCC sparkling wine is delicious.